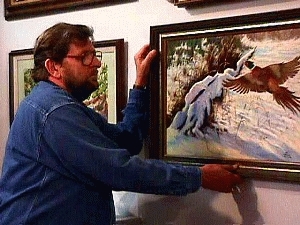 Len Williams of Waynesville, Ohio, a down-home painter of wildlife and the great outdoors, took a few minutes away from his duties at the Town & Country Fine Art Gallery, an artists' cooperative in Kettering, Ohio, to talk to me for this profile. Len doesn't usually say much about himself unless you ask, but he is always enthusiastic about his art. Q. Len, how did you get started in the first place? A. Seems like I've always been drawing, since I was a kid. Used to copy cartoons from the newspapers every chance I got. It was good practice. In the Army I picked up sign painting skills and I've done that for 45 years. It helped me learn layout and design. I never had art training, just a local class at first and then some workshops. When the kids were older and didn't need me so much, I started spending most of my spare time painting. Q. Who did you study with in the workshops? A. Well, for 13 years I went out to Montana to the Pro-Art Jack Hines and Jessica Zemsky workshops. I'd say Jack was probably the most important in helping me improve as an artist. He also brought in some other artists to teach workshops, like Robert Bateman, Clyde Aspvig and Mort Solberg. I did my first outdoor paintings with Clyde, and Mort is a great teacher and designer. 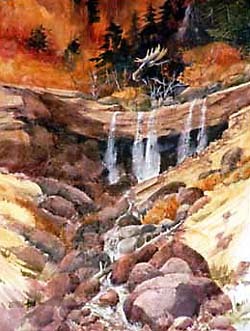 I was working in oils then, but one year I took watercolor with Nita Engle and I've been doing watercolors ever since. A. I'm a realist painter of wildlife--birds, mammals and fish in their natural habitat-- and rural scenes. I live in the country, surrounded by natural beauty. I don't paint abstracts, but I admire them, and I try to get good abstract design in my own work. I like to paint outdoors. Seems like I get more expression into my paintings when I've been on the scene, and it's great just being outside and experiencing it. Q. What's the hardest part of being an artist? Some people talk about the fear of the white paper or canvas, but that isn't my problem. I get excited about starting a new painting and really go at it, then about half way through I find myself struggling and for awhile it's very hard work. And then, suddenly I realize it's done. Q. Len, I know you've had your share of awards and exhibitions, last year being juried into a national show in Colorado. You also do art fairs and wildlife shows. What would you say is the best thing that has happened to you as an artist who sells? A. This gallery--Town & Country Fine Art Gallery. We opened six years ago with 26 artists and it has been a great place to show and sell art. The gallery is a beautiful space. Q. If you could paint anywhere in the world, where would it be? A. Alaska. That would be great! Q. What's next in your art career? A. Jack Hines encouraged me to teach, and I think I might give that a try. I've done some demos for kids and thought I'd start with that, but whatever I do, I won't let it interfere with my painting. A. Plan to work hard. You may be born with talent, but it has to be developed. Study and serve your apprenticeship. You can't do anything unless you try--and stick with it. Thanks, Len for your time. I enjoy seeing Len's watercolors in the Town & Country Fine Art Center in Kettering, Ohio.